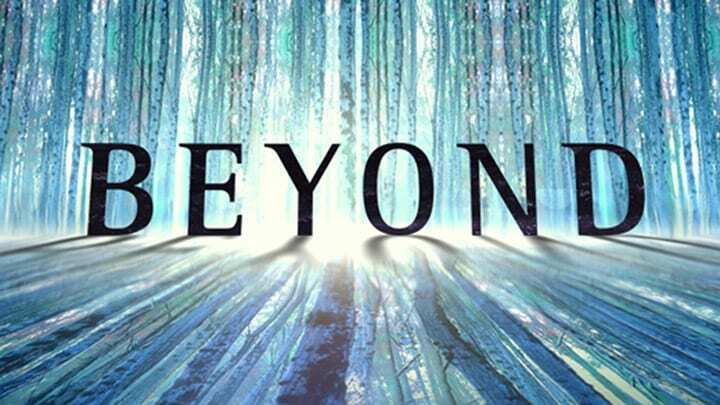 One of the biggest problems with Beyond so far is its snail pace. We know to some degree who the central characters are but have been given little information about their motivations. Up until this point, I've felt as though I've been waiting for this show to actually start to go somewhere. I really hope that Fancy Meeting You Here, is the beginning of that, even if Holden's actual role in this episode was easily the least interesting part of it. So, when last we saw Holden he was sitting in Luke's dorm room after beating the piss out of Yellow Jacket. This week, Luke tries to teach Holden how to do laundry and they talk about Holden attending class. Holden is nervous because he didn't even start high school, but Luke assures him that he already knows more than the people he's in school with. Holden accompanies Luke to his class where he gets a crash curse on Jung, Freud and dreams. This is enough of an inspiration for Holden to ask Jamie for a second chance when she runs into him again. In Monte Carlo, Charlie, who seems to be in a mood to have a little fun, instructs a gambler playing blackjack to draw a card on a hard 17. When he does, he ends up with 21. When next we see Charlie and the gambler, they are being accosted by casino security because they believe Charlie to be guilty of counting cards. Charlie explains that what she did was so much more than that but they remain unimpressed with their skills. Charlie makes her escape by taking a bite of the head of security's hand. In the absence of Holden, Willa is keeping a vigil at Arthur's bedside. Willa tries to get some answers out of Daniel regarding the other coma patients but he's very noncommittal in his responses. Once left alone with Arthur, Willa breaks into Arthur's safe and steals his papers and some recordings of his experiments. Holden is ready for his big date with Jamie. Luke and Riley are there as well, making it a double date. They all sit at a table and things are going pretty well. They drink, tell stories, and Jamie even admits to liking Holden. For once it seems that Holden is able to shake the visions of the Realm and Arthur that he keeps having. When next we see Charlie, she's headed to a street fight. Tess makes an appearance and both women make opposite bets on a street fight. Tess isn't there for the pleasure of gambling but to see if she can get Charlie to work for Hollow Sky. Charlie has been given this offer of employment several times it seems and she hasn't changed her mind about not accepting. Tess sweetens the pot by explaining just how strong Holden is and her belief that Holden is able to cross the bridge. What the hell is the bridge? Charlie still refuses to accept the job and so Tess reveals that Arthur got to Holden first. That's enough for Charlie to gain some interest. Tess then offers Charlie a trade which we are not privy to. Back home, Willa is going through the items that she collected from Arthur's safe. Willa goes through the videos of Arthur talking with his patients about the experiences they had while comatose. He explains that the unconscious mind goes somewhere, leaving the body behind. This is clearly treading over ground that we already know. No wonder parts of this episode seemed to just drag the hell on. On the tape, one of Arthur's subjects goes into cardiac arrest. Arthur brings the patient back and then makes reference to consulting with Dr. Frost. This catches Willa's attention. Who's Dr. Frost and why does Willa knows the name? I suppose this is something we will learn about later. The problem is that I just don't care. With dinner out of the way, it's time for some bad karoke. Jamie encourages Holden to sing a song and when he shows some reluctance, Jamie suggests that Holden owes her because he stood her up on their first date. Holden and Jamie start to sing Try by Macy Grey. It's so bad that I'm sure that my ears even bleed a little bit. Things are going well until Holden starts to see the Realm and Arthur. Holden stops singing and Jamie becomes concerned. When the vision ends, Holden runs out of the karoke bar and Jamie quickly follows. Jamie tries to comfort Holden and asks what is going on. Holden tries to explain that there's more hold over from his coma and that he cannot explain. Finally, Holden asks for a moment alone. The look on Jamie's face makes it clear that there won't be a second date. Holden pleads with Jamie but she makes it clear that if they have to work for a relationship then it's not meant to be. Wow, I'd like Jamie to text me when she comes across a relationship that she doesn't have to work at. In his distraught state, Holden runs out into the street and gets hit by a car. This is enough to knock Holden out and he has a vision of himself fighting off dogs in the Realm. It turns out that this is how he first met Willa. When Holden regains consciousness, the driver of said car makes it clear that what happened was Holden's fault. Holden doesn't bother to really listen and instead turns to a worried Lucas who arrived while he was unconscious to say that he's got to see about a girl. Yes, they stole that directly from Good Will Hunting. Luke thinks that Holden is talking about Jamie and is quick to tell him that Jamie has left. Holden explains that he's talking about another girl before running down the street. Charlie is at a bar and while watching reports about Holden coming out of his coma, she opens up her stock profile and gets to work. She spends what appears to be hours and increases her worth from several hundred thousand to just over a million dollars. Charlie's increase in coin does come with a cost and she ends up running into the bathroom to be sick. Holden makes it to Willa's place and the two kiss. It seems that what he remembered after being hit by the car is how he met Willa. It's now clear that while Holden was in the coma that he had a thing with Willa. The two make it to the couch still kissing and marveling at each other. Because Willa left her laptop open, Holden sees Arthur's image frozen on the screen. It turns out that Holden is more interested in getting to meet Arthur than he is in making out with Willa. Holden and Willa head to Arthur's, where they meet Daniel. Willa explains that Arthur moved in and out of the realm while he was training Holden. Willa adds that Arthur got stuck and became unable to communicate shortly after Holden came out of his coma. Daniel adds that they've been waiting on Holden to help Arthur. It seems the plan is for Holden to be induced into a coma like state so that he can enter the realm and help Arthur. Willa leads Holden to the machine that they use. Before Holden even enters the room, the machine starts to power up and flashing lights can be seen coming from under the door. Willa is amazed by this having never seen this reaction coming from the machine. Holden moves slowly towards the machine as he gets an image of himself in the realm on an ice bridge. Willa appears behind him on the bridge but the ice begins to crack. Willa calls out for Holden and he gets there in time to catch her hand and stop her from dropping. Holden desperately tries to hold onto Willa but her hand slips from his, causing Willa to plunge into a deep cavern. When Holden's mind returns to the present, he instructs Willa to step back and then destroys the machine as she screams. Once done, Holden explains that they are never going back because he lost Willa once and he's not willing to do it again. Luke is back in his room with Riley. He sits silently as she pours a drink and takes some drugs. When Riley expresses concern, Luke explains that he doesn't think that what's been going on with Holden is at all normal and wonders if maybe Holden is ready to live in the world. Charlie might just be the saviour of this show. I love that she is snarky and capable. I find her far more interesting as a character in the few minutes she's been on screen than Holden has been for the last four episodes. I'm not sure that she'll be enough to save Beyond for me but she certainly does help. Beyond moved the plot forward minutely this episode but I'm still unclear about exactly what the Realm is and what role Arthur and the shady corporation have to play with it. We know for sure know that there are other coma people who have been there and have also come back with powers. I do however think it's telling that it's Holden whose powers manifest in a physical way, while Charlie's are more cerebral. I really see that as enforcing gender roles. This is probably the best episode of Beyond to date and yet I still find myself bored. Watching paint dry is more interesting than this show. It doesn't help that we really haven't been given a reason to invest in these characters.